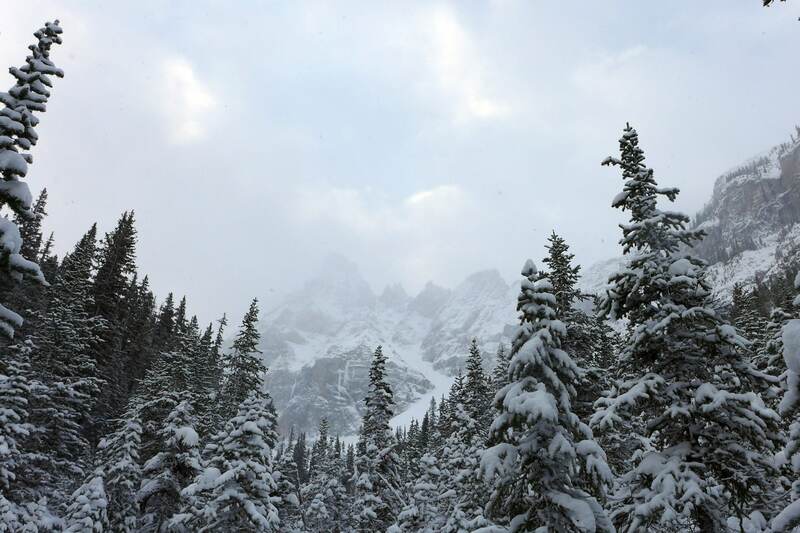 I thought I’d take an opportunity on a rest day here in Canmore to get back to this website’s roots, and put together a few pictures and a few words about winter climbing – and rest days. 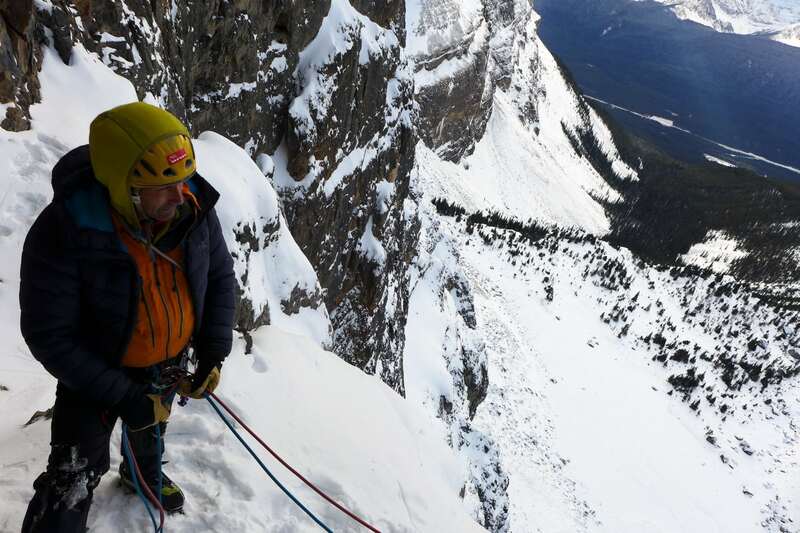 It’s been a good trip into the unknown for me here in the Canadian Rockies, less in to the unknown for my partner Nick Bullock, and definitely least of all for our local ringer, Raphael Slawinski. Although, even Raphael seems happy with having done three routes he hadn’t done before. 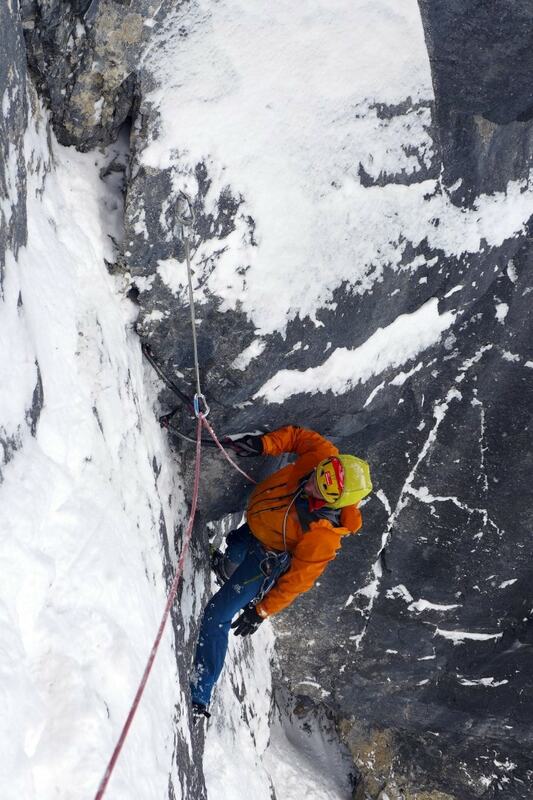 Nemesis, an amazing ice climb with a two hour approach that begins to feel roadside after a week in the Rockies. Nick Bullock photo. 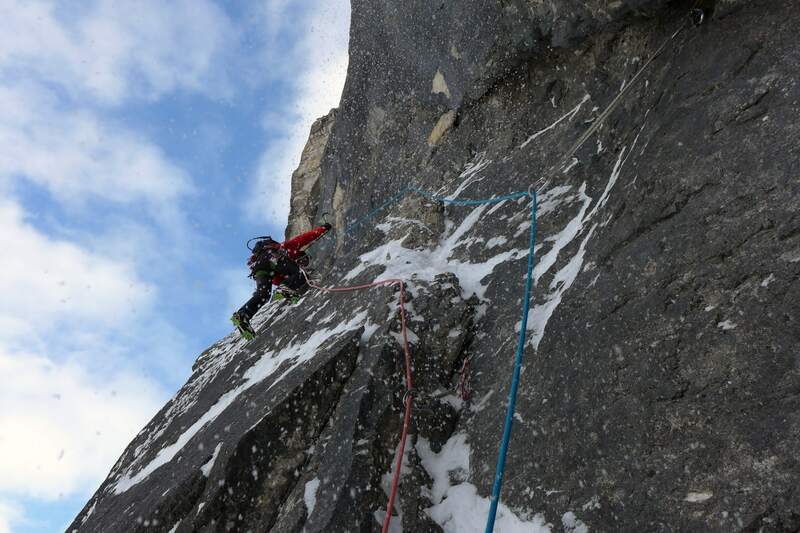 For our “warm up”, and the day before meeting up with Raphael, Nick and I did the classic WI 6, Nemesis. I had unfinished business, on an earlier attempt, ca. 2003,my partner and I were forced to retreat after two pitches by a quarter-sized hemorrhoid hitching a ride behind the man who will remain anonymous. Nick had history with the route too, before this trip he had done it three times! So when I offered to clean the final 30’ pitch on rappel so he didn’t have do it, he agreed. After all, I’d put as many screws into that little number as he had in the 150’ of WI 6 below. Maybe catching bigger fish will help with my fitness for next winter? 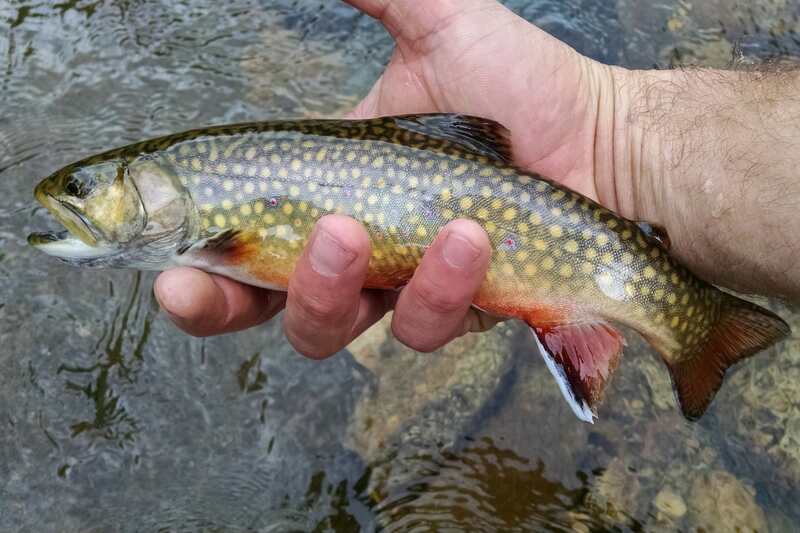 I’ve done a lot of fly fishing this year, and while there may be some similarities between casting a fly rod and swinging an ice axe, you might be surprised to find out that fishing isn’t great training for winter climbing. 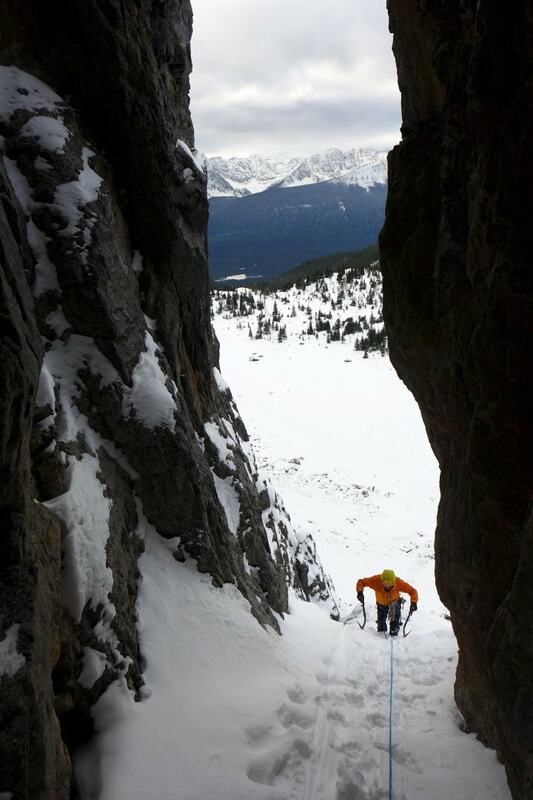 Nonetheless, on our second day we were back on the Stanley Headwall. The rarely formed Sound and the Fury was the objective and it looked amazing and somewhat familiar – reminiscent of Poke-O’s Endangered Species, Cathedral’s Remission Direct or some other engineering-project-of-a-climb you’d find on the South Face of Frankenstein. Nick wrote a funny piece about it, find it here. Raphael entering a classic M5 corner towards the top of the first pitch of The Sounds and the Fury. Nick and I tend tend to be in agreement about a few vital things, one of which is the idea that a good climbing trip is more about quality than quantity. This perspective allows us the freedom to stack up rest days. With a couple of well-rationalized and precious days off behind us were we back in the rental car with Raphael driving west on the Trans-Canada Highway, towards Castle Mountain and the Protection Valley. The Protection Valley seems like a somewhat obscure climbing area enjoying a brief moment of popularity. 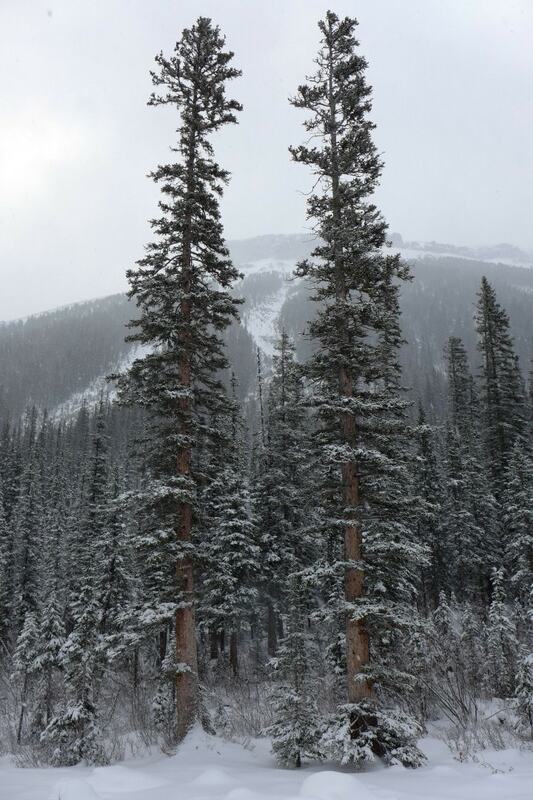 Most of the climbing that has gone on up there was accompanied by a bivi, but the word this November was of a good approach track and barely any snow making it doable in only three hours. The word really was out because there were three other cars already parked when we arrived in the last of the night’s darkness, just before 7am. Grab the Cupcakes begins in the chimney system in the center. 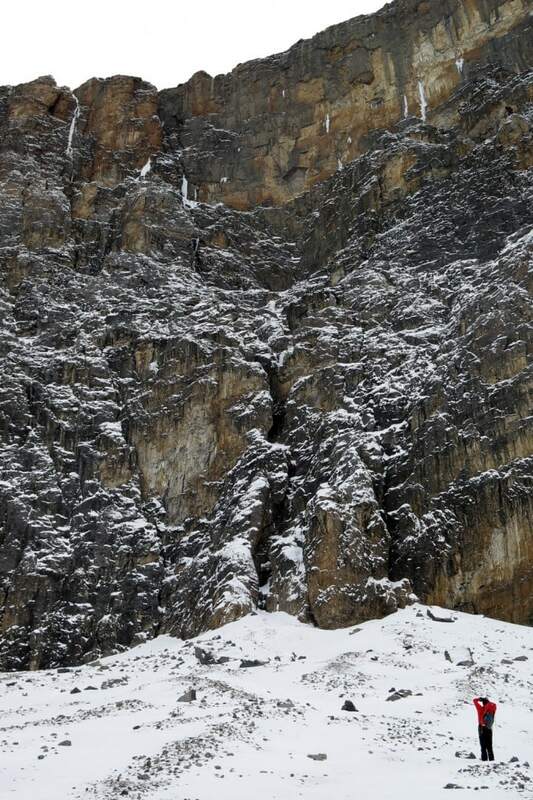 The streak of ice high on the left corner of the photo was unclimbed… and still is, but was great bait to get here. Raphael Slawinski photo. The plan for the day was an ingenious ruse meant to lure Raphael into doing the second ascent of an interesting line that had been the topic of discussion all week. 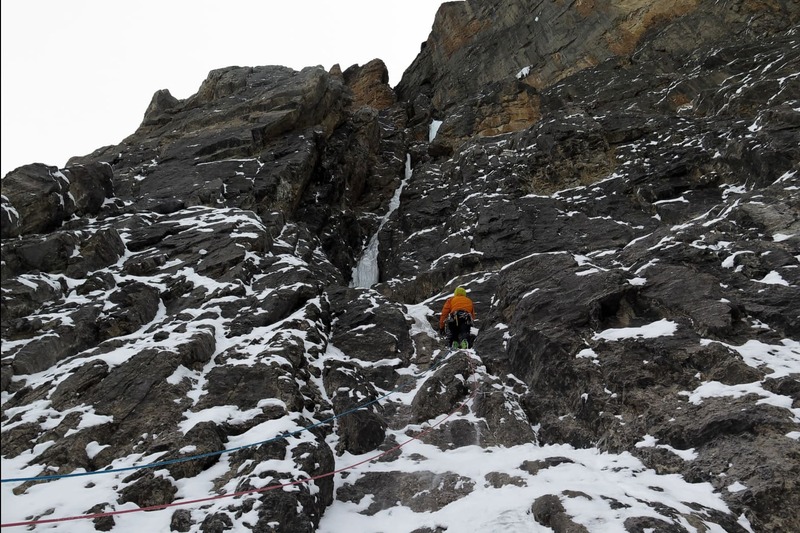 Being on vacation, both Nick and I lost little motivation when told that Raphael’s line had just been climbed by local guides Kris Irwin and Jay Mills (Grab the Cupcakes, M6 WI 4+, you can read about it here.) Raphael however began to offer up other alternatives. 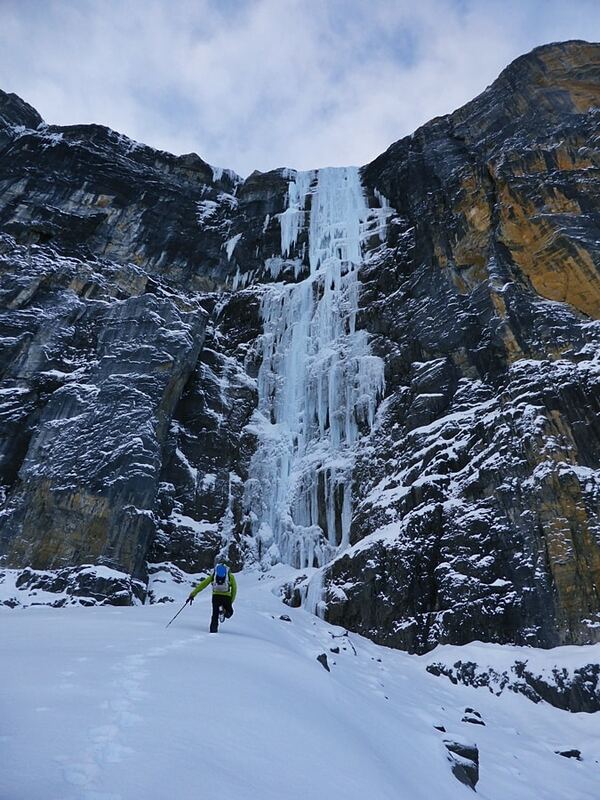 Undeterred, we reconnoitered a parallel route on an internet photo to gain a different icefall. Nick quickly drew in the proposed line and sent it to Raphael as if we were applying for the Slawinski Grant. It worked, putting us ostensibly back under the banner of exploration and adventure. After almost three hours of walking we were happily ensconced in the beautiful Protection Valley below the parallel objectives, one real and one imagined. Nick very diplomatically, and I less so, pushed for the 2nd ascent option. Raphael agreed and with a quiet wink we racked up. Approaching the belay on top of the first mixed chimney pitch. 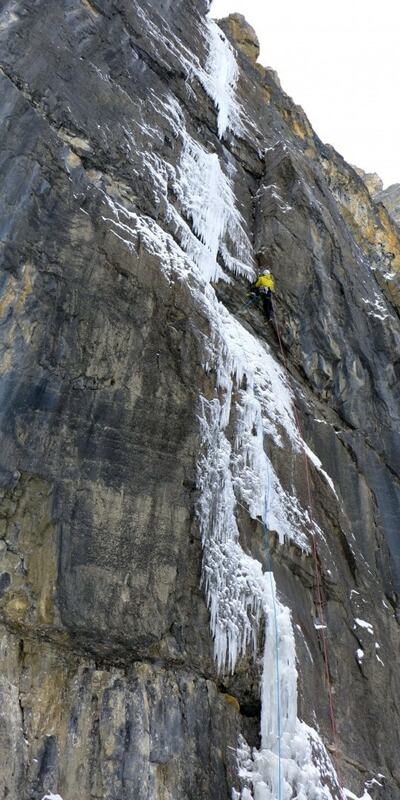 Moderate ice flying quickly below Raphael’s feet on the second pitch. Nick Bullock photo. 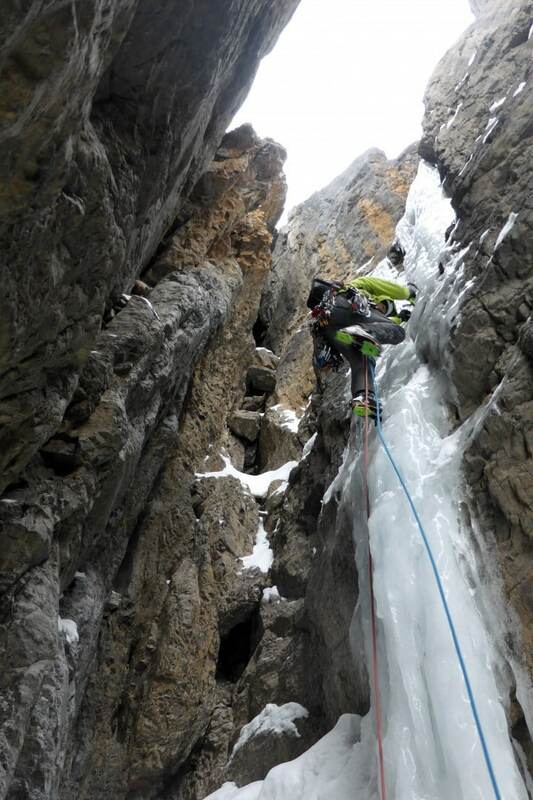 Nick working his way up mixed ground to somewhat rotten ice, after a 200′ snow field. Raphael Slawinski photo. 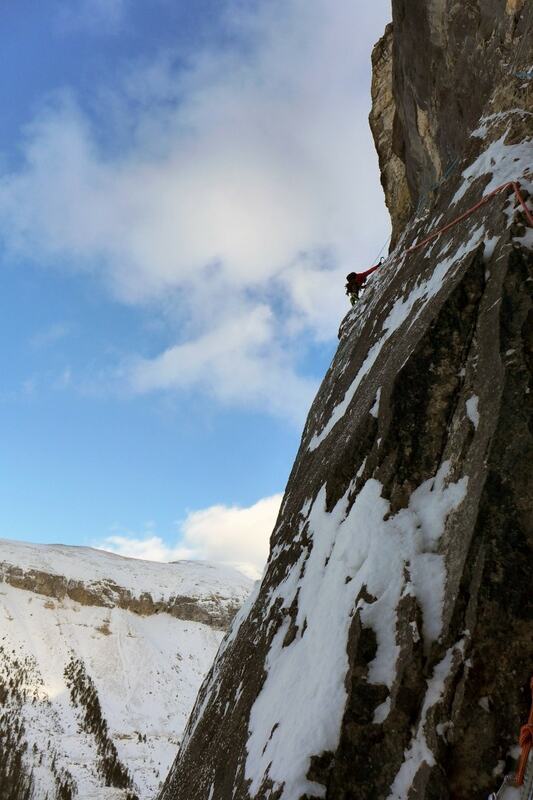 Raphael leading the 6th pitch, a great WI 4+ pillar above a comfy ledge in a great setting. Nick Bullock photo. Nick finishing the last pitch, just before the evening breeze kicked up a bit. If you listen carefully to the video below you can hear him screaming. Raphael Slawinski photo. 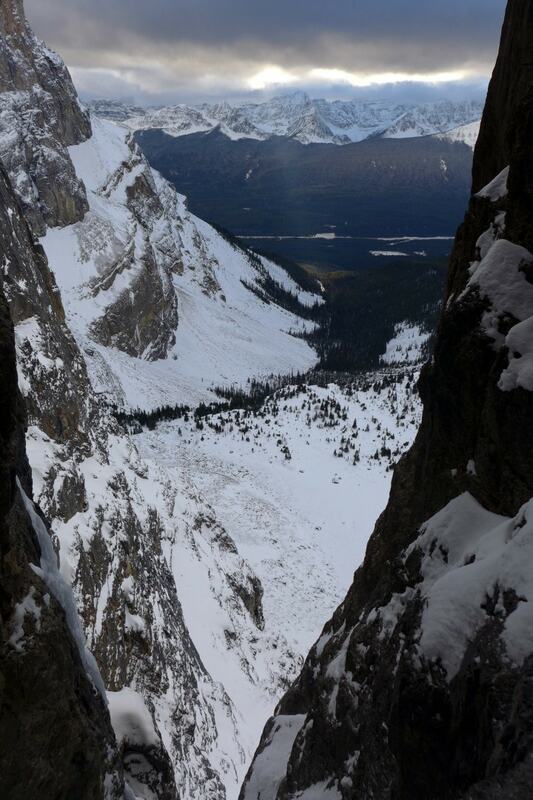 The view from the belay at below the 7th pitch. Somehow it got a little Scottish in that last 30′ pitch. Nick Bullock photo. The Slimarillian Indirect just visible through the trees, and luckily the closest route in the Storm Creek Drainage. Worn down, even after another rest day, but hiking again, Nick, Raphael and I entered a beautiful soft wood forest as we wandered our way towards Storm Creek, which drains a quiet valley next door to the popular Stanley Headwall. 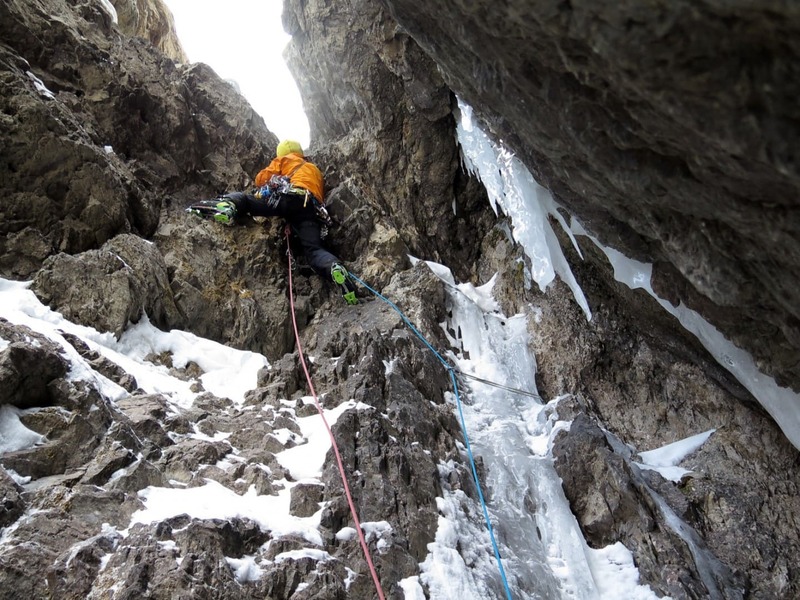 We were en route to try and repeat the Silmarillian Indirect, a route that was just done the previous week by the local Jon Walsh and the visiting Scotsman Greg McInnes. 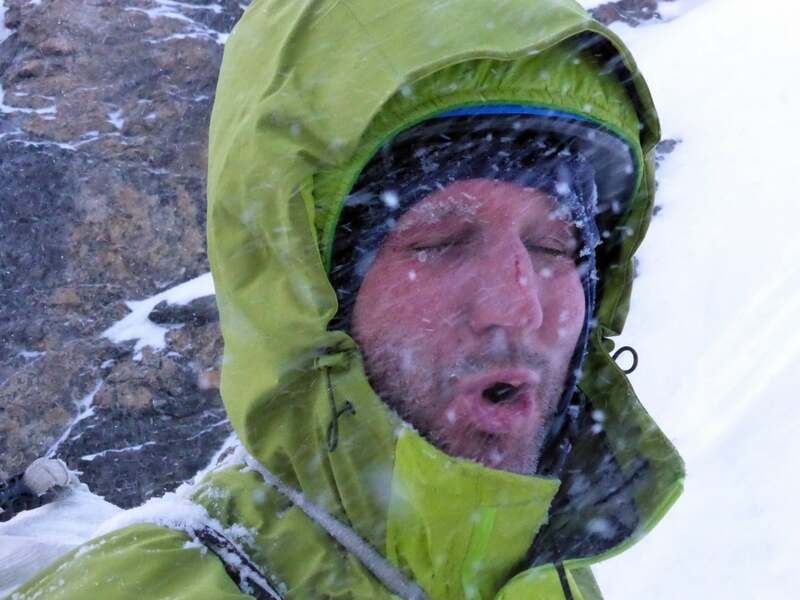 I racked up in the deep snow and started up the low angle, and snow covered first pitch.. only to have my crampon come loose! Not trusting my footwear, and being an expert in knowing when I’m not up to the challenge, I passed the sharp end off to Nick who dragged the double ropes up behind. Closer inspection a pitch up, and out of the deep powder at the base, revealed that one crampon had gotten rearranged, probably while sharpening, and was sized too big – oh the early season! 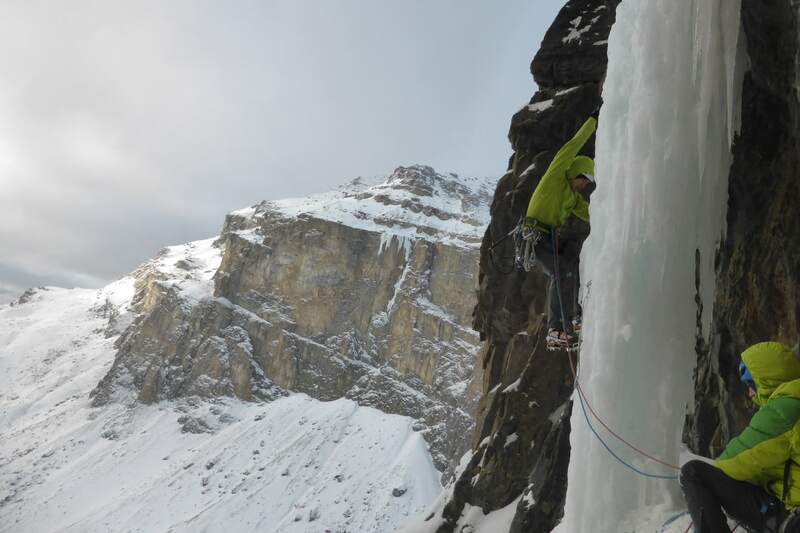 The final pitch that Raphael led to the base of a WI 5 ice flow was a memorable rising traverse of true mixed climbing. 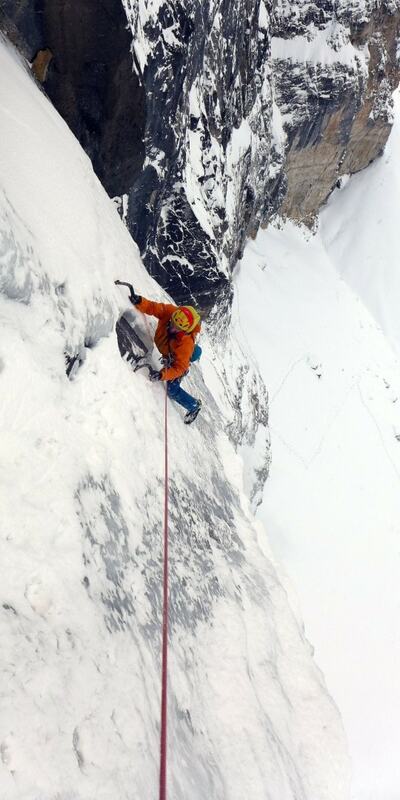 There I am, still with two crampons. Nick Bullock photo. The ever dapper Nick Bulllock, giving his knees a rest on a slabby pitch. 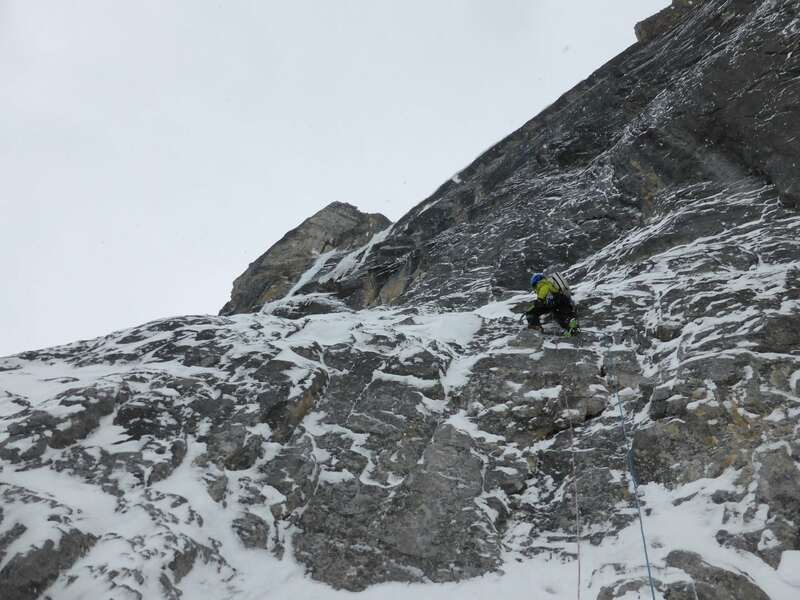 Raphael Slawinski on the best pitch of the route. The end of the rock section. Still going. Nick following the icy bit at the end. I took this shot for my dad.